In order for us to have our good deeds accepted, and our sins forgiven, we need sincerity of intention. A person may do good deeds their whole life without them being accepted, because they were actually doing them for someone other than Allah. However, if we do something purely for Allah and according to the Sunnah, Insha’Allah He will accept it. 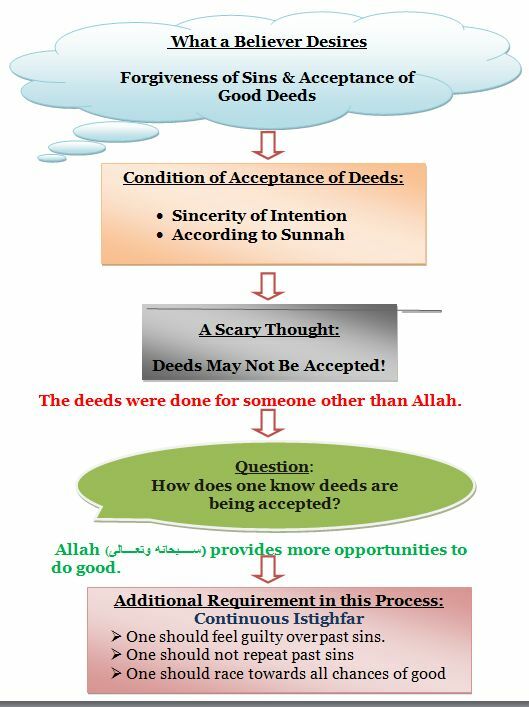 A sign of good deeds being accepted is that Allah provides more opportunities to do good. We should therefore grab every such opportunity that comes our way. Every opportunity to do good is a blessing as well as a test. Along with doing good deeds, it is also important to constantly ask for forgiveness for past sins. In this too, we require sincerity of intention. The guilt we feel over sins is also a blessing of Allah, because if we did not have that feeling of remorse, we would not ask His forgiveness, but would keep doing wrong without even realizing it. This entry was posted in Uncategorized and tagged Deeds for Allah (SWT), Following Sunnah, Forgiveness of Sins, intention, Istighfar. Bookmark the permalink. This post was an excellent reminder! The color-coded, concise chart is great. Great reminder.We should try to grab every opportunity that comes our way so that we do not regret on the Day of Qiyamah. We should ask for forgiveness if we have committed a sin, so that we can receive Allah’s mercy and tranquiility.